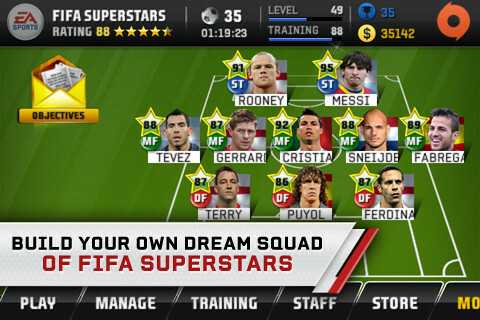 Fifa Superstars is a freemium football management game from EA. That’s right: after feeling emotionally stabbed by the abomination that was Theme Park, I’ve been brave enough to navigate through another freemium game from EA. 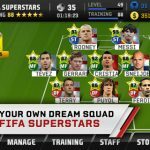 Thankfully, Fifa Superstars is actually quite good. 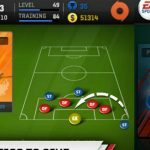 Although you don’t play matches, you control everything that goes on behind the scenes – from the equipment and tactics that your team plays with to which formations you use, which players you buy and more. 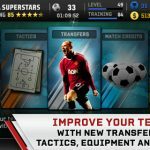 Each match that you play knocks a few points from your team training tally, temporarily reducing your overall rating; to keep your team winning, you need to ensure they have a high overall rating. If your rating is higher than the team you’re playing against, you can be fairly certain of a victory. To up your overall rating, you can transfer players and buy performance-enhancing equipment (better shoes, for example) that modifies player statistics for a set number of games. Of course, it wouldn’t be a freemium game without a freemium payment model, and rest assured, there’s plenty of opportunity for you to splash your cash on this app. As well as using virtual money to buy items in the game, you can also buy them with ‘premium’ cash – that is, actual cash. Some items can only bought with premium cash. The most significant of these are match credits, which allow you to play games – when you run out of match credits, you can’t play any more games. Although you earn one extra match credit every two hours (whether you’re playing the game or not), that does mean that you’ll struggle to play the game for long unless you cough up some change. The lowest amount you can spend on premium cash is $3.99, which will get you 100 premium cash, enough to buy 22 match credits with. It’s hardly cheap, but no-one’s forcing you to pay; if you don’t have any match credits left, you can always leave the game to one side and come back the next day. Another time restraint designed to frustrate those that don’t like to pay for things whenever possible is training – to restore your training level back to 100, you can pay 5 premium cash. Otherwise, you’ll have to wait set lengths of time to increase the training level by certain amounts. The shortest wait is 5 minutes, and the longest is 8 hours. Surprisingly, I found that I didn’t ever feel annoyed by the frequent waiting for more tokens. It just meant that each of my decisions had to count for more. There are nice incentives to keep you playing whether you’ve paid to or not. Occasional bonuses give you free equipment, players and premium cash. Completing specified tasks (e.g. completing a league) also rewards you with such items. That means that you’ll slowly accumulate premium cash no matter what, so those that don’t want to pay anything will still be able to buy everything in the game after a very, very long time. As well as an EA logo burning its image into your brain from the top left of the screen, adverts for EA games sometimes pop up and encourage you to click on them. They’re easy enough to close, but are still a minor annoyance. 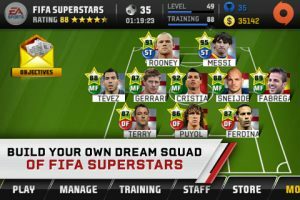 Far more aggravating is the fact that you can only play the game when you’re connected to the internet – not ideal for iPod Touch users. This internet connectivity requirement is probably a result of EA wanting to ensure that you log into its (fairly uninteresting) Origin social network. From time to time, it attempts to persuade you to interact with this network through pop-ups. Presentationally, everything is very clean and easy to navigate. Clicking on the aforementioned EA logo zooms you back to the main menu, from which you can access all of the different parts of the management system. When you first load the game up, you’re guided through the basics, to ensure that you won’t get stuck. The one song that comes with the game is good, though it didn’t take many repeats before I stuck my own music on. Overall, Fifa Superstars is quite entertaining. Its freemium system is well implemented, though a little expensive. EA have yet again made every effort to ensure that you give them money, but have managed to do it non-intrusively here. A good game for football fans. Check out our reviews of FIFA 12, football management sim Football Manager 2012 and PES 2012!